Not my very favorite of her books, which means What Happened to Goodbye is still better than 95% of realistic teen fiction. Sarah Dessen never gets old for me. Look, I love Sarah Dessen. If you’ve read more than handful of my blog posts, this won’t come as any surprise to you. So it is likely also not a shock that when this arrived in my mailbox (thanks to Kelly who picked it up for me at Midwinter in San Diego last week), I finished it within 36 hours of its arrival. Because I am one of those people with a strong need to categorize, I think of Sarah Dessen’s books as having three categories. There are the first four books which, um, I guess I’d categorize as “Misc” (my librarian self HATES this categorization but I can’t think of anything better; they’re all so different, but don’t fit as well into the other categories). The second group are the really romantic books (The Truth About Forever, Just Listen, and This Lullaby), which probably explains why those three are my very favorites, and then her most recent three books which I think of as the self-discovery books. They have the romance element in them, but it’s less the driving force of the book. I noticed this in Along for the Ride and it was even more obvious to me in this one. Mclean’s parents had a messy divorce and since her mom is the one who walked out on their marriage, Mclean chooses to live with her dad (even now, two years later, she still is incredibly angry with her mom). Her dad, though, is a restaurant consultant, meaning that he is assigned to a restaurant for a few months until it’s been turned around and then he’s off to the next location. Which means that here in Lakeview, Mclean is on her fifth high school. She doesn’t really mind. After having the same friends and the same location her entire life, she is eager to leave her old self behind and reinvent herself at each new stop, then walking away when her dad needs to move again. In Lakeview, though, she accidentally ends up with her real name and some of her old life starts slipping into her new life. Her next door neighbor, Dave, is working to juggle his new and old lives too – he is a ridiculously smart guy, but after attending a private school for years, he transferred to the local high school (not known for its amazing academics) so he could have some real teenager experiences, but he got into some minor trouble and his parents have come down hard on him, wanting him back at his old school, and back to the Ph.D. track they want for him (they’re both professors). But while Davis is very open about his life, his struggles to be a normal kid and maintain family calm, Mclean is hesitant to share the details of her life with him or anyone else. She might be using her real name in this town, but she’s not sure she’s ready to share her real self. 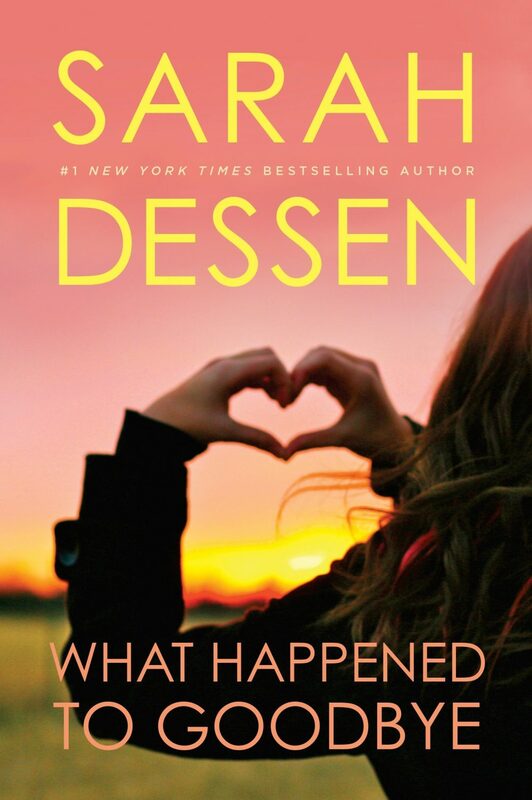 Over the last couple of years, I have read one book after another that swears to be perfect for fans of Sarah Dessen and almost without exception, they are major disappointments. Part of that, I’m realizing now, is that that label seems to get slapped on to every realistic fiction book that has a romantic angle. And the romance is never the entire reason for a Sarah Dessen book. Her books are so thoughtful, with so much time spent with the main girl. These are character-driven books, not romance-driven ones. I have a special place in my heart for authors that give their fans little shout-outs by sticking in characters from other books. This one has several – a quick non-named glimpse of Owen and Annabel from Just Listen, the stepmom from Along for the Ride, and Jason, the nerd boyfriend from The Truth About Forever (he actually has a fairly large part in this book). And I may have missed some other ones – it’s been a while since I read some of the older ones. I think sometimes Sarah Dessen gets a little bit of a bad rap for her books being very similar, and, yes, her books do have a distinct flavor to them, but there’s nothing formulaic to me about them – each one has such rich characters (I feel like each book has entire town of varied people, none that are caricatures), such varied life circumstances, and such real emotion. Please let her never stop writing. Ooh, this is the first in-depth review I've read about it. Thanks! Along for the Ride is my favorite of Dessen's, so this looks perfect. I can't wait. I have got to read Just Listen! I read the first chapter of this one online somewhere and it really hooked me. Looking forward to finding it. I've never read any of Dessen's books. For shame, I know. I shall have to rectify that. Would you believe I still have never read a Sarah Dessen book? Every time I read one of yoru reviews I tell myself I'm going to get on that… but it still hasn't happened. Maybe once I live near a decent public library this will change! Oh you silly people who haven't read any Sarah Dessen books yet, get thee to a library or bookstore STAT! Cannot wait to read this one!! I have never read anything that fast in my entire life!!! You are amazing!!! I don't know if you find it weird that I admire your love for reading or not… but seriously I think it is great that you have such a passion and thirst! Keep doing the things you love!!! I'm pretty sure you've commented on this before, but if one were to read her first Dessen book, which one should she start with? Along for the Ride frustrated me. I can't remember, now, why, but it made me leary. I always felt such affection for her other books! I'm certain I'll try this one too, thanks for the review! I loved The Truth About Forever. Maybe I'll pick this one up. So, back to the no gift parties from forever ago. I received an invitation that said "Your presence would be lovely, but presents are not required". Pretty cute. I think I'll make it standard when we start doing friend parties around here. Random, but I'm not sure I could read this without trying to put the story in Lakeview, Oregon. (If you don't know where Lakeview is, please take a minute to look it up. lol) Also, our public library does not have one single book of Sarah Dessen's. Will have to order it from another library.